ST. PETERSBURG, Russia (AP) Mohamed Salah has the perfect chance to start Egypt’s World Cup party and put Russia’s on hold when he returns for a crucial match on Tuesday. Egypt needs his mercurial talent and scoring touch, for defeat will end Egypt’s World Cup outright if Uruguay beats Saudi Arabia on Wednesday in the other Group A game. Salah’s recovery from injury has become an ongoing mini-drama for Egypt fans, although their devotion is understandable considering he netted 44 goals in 51 games for Liverpool in his first season and has 33 in 57 for Egypt overall. Last Friday, Pharaohs fans watched in frustration as Egypt failed to break down an obdurate Uruguay lineup. Egypt did not want to risk Salah aggravating his left shoulder against the physical Uruguayans. It may yet prove a smart decision considering he would have been playing against defender Diego Godin, one of the most uncompromising and hardest markers in the game. Now Egypt can unleash Salah on Russia’s lesser-regarded defense in St. Petersburg, and it could be an eye-opener for some people. 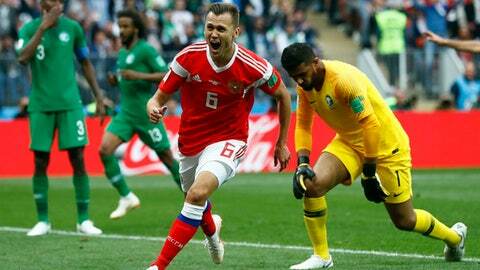 Russia’s skeptical fans will be seeking confirmation: was last week’s 5-0 rout of Saudi Arabia in the tournament opener a promise of things to come, or just a one-off? Such is the dependency on Salah to perform, and given what’s at stake, the Liverpool marksman may feel like he’s playing in another final. He’ll want to make the most of it, too, considering how his bid to win the Champions League last month was stopped following a dubious first-half challenge from Real Madrid defender Sergio Ramos that forced him from the field with an injury. Salah’s enforced absence, however, comes with at least some form of compensation. He hasn’t played since May 26, so he has fresh legs after a grueling season with Liverpool. If Egypt can get a result against Russia, the Pharaohs will be confident of knocking over Saudi Arabia next Monday – especially with Salah up front. Denis Cheryshev probably never thought the whole of Russia would be watching him so closely. Since his two expertly-taken goals against Saudi Arabia, the left winger has been doing the rounds on television shows and is becoming a familiar face. Those were his first international goals – which is twice as many as his father, striker Dmitri Cheryshev, managed in a brief international career spanning 10 games. Now fans will be expecting more from Cheryshev Jr., and he may want to embrace it. For perhaps the time has come, at the age of 27, for the skillful Cheryshev to fulfill the potential Real Madrid once saw – signing him in 2009 when he was 18. Madrid moved in for him after his impressive performances for Russia’s youth teams, scoring regularly with 16 goals in 27 games up to Under-18 level. After more than 100 games for Madrid’s reserves, he finally broke into the first team – but made only two appearances and never got another chance. The same fate has befallen many other talents at Madrid, and the inevitable loan spells followed before Cheryshev joined Villarreal on a permanent basis in 2016. More spectacular goals in Russia could help Cheryshev’s stop-start career take off.